An introductory range of 39 encaustic colours in 104ml blocks, manufactured by hand by R & F Handmade Paints, Inc. in the USA. R & F lovingly prepare small batches of colours to ensure high pigment content and consistent quality. Although its history goes as far back as the 5th Century BC., encaustic is so versatile that over the last 50 years it has again achieved popularity as an unusual alternative to oil and acrylic paints. Encaustic is a wax based paint (composed of beeswax, resin and pigment), and is applied in its molten form to an absorbent surface and then reheated in order to fuse the paint. The word ‘encaustic’ comes from the Greek word “enkaiein”, meaning to “burn in”, referring to the process of fusing the paint. As the paint cools it fuses to create a lustrous enamel effect with unique visual properties that makes it perhaps the most beautiful of all artists’ paints, and it is as versatile as any 21st century medium. It can be polished to a high gloss, carved, scraped, layered, collaged, dipped, cast, modelled, sculpted, textured, and combined with oil. It cools immediately, so that there is no drying time, yet it can always be reworked. Encaustic paintings do not have to be varnished or protected by glass because encaustic, which is the most durable of all artists’ paints, is its own protector. This is because beeswax is impervious to moisture, which is one of the major causes of deterioration in a paint film. Wax resists moisture far more than resin varnish or oil. Buffing encaustic will give lustre and saturation to colour in just the same way resin varnish does. Over time it will retain all the freshness of a newly finished work. Encaustic paint will not yellow or darken. However, wax itself is photoreactive, so unpigmented encaustic medium that has been kept in dark storage will darken slightly. When re-exposed to light that darkening will bleach out. Encaustic paint does not require the use of solvents. As a result, a number of health hazards are reduced or eliminated. 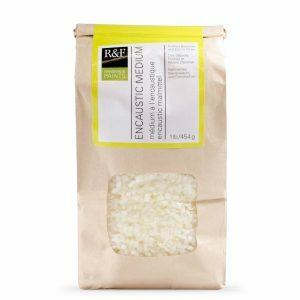 Encaustic Medium is an essential component to encaustic painting. Beeswax on its own will remain soft; the addition of damar resin raises the melting temperature and will allow the beeswax to cure and harden over time. Medium is typically used to create transparency and extend encaustic colors. It can also be used for mixed media and sculptural applications. Encaustic Medium is the encaustic paint without pigment. R&F have built their reputation with encaustic and have been instrumental in the expansion of the medium. When R&F began in 1988 it continued a tradition of high-quality commercial encaustic paint production dating back to the late 1940s. R&F’s encaustics are milled with the time-honoured methods of paintmaking. They use 100% pure pharmaceutical grade (USP) beeswax, which has been filtered without the use of chemicals, Singapore-grade damar resin and a heavy pigment load. All of this results in the highest quality artist paints on the market. Norwich Art Supplies stock an introductory range of 39 R&F encaustic colours in 104ml blocks, and R&F Encaustic Medium in 454g bags.